A man believed to be responsible for a number of bank robberies in Kelowna has been arrested and charged. William Gordon Martens, 58, was brought into police custody on Saturday morning and charged with three counts of robbery. He was arrested after his latest alleged robbery, which happened shortly after 8 a.m. on Saturday at the TD Canada Trust on Harvey Avenue. "Our front line officers spotted the suspect alone inside a motor vehicle travelling in the area of Springfield Road and Hollywood Road South," said Cpl. Jesse O'Donaghey. "Those officers conducted a high risk traffic stop with the black Dodge Neon and managed to take that suspect into police custody without incident." 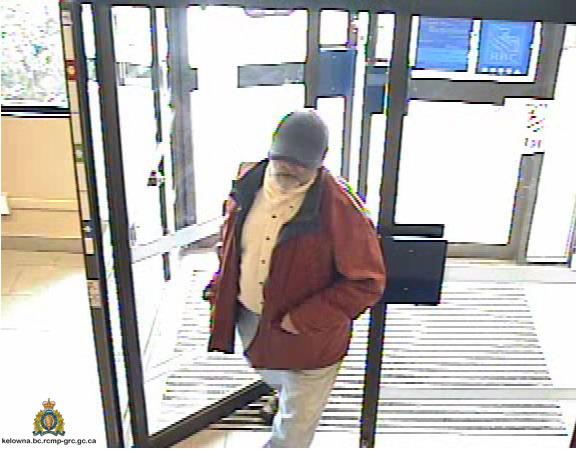 He’s now been linked to a pair of other robberies, the first of which occurred at the Scotiabank in Rutland on Jan. 31. His second alleged offense was at the Royal Bank of Canada in the Mission on March 1. Martens has also been charged with disguising face with intent to commit an offence and use of an imitation firearm while committing an indictable offence.